The magnificent Palazzo Piccolomini, indisputably Sienna’s finest Renaissance structure, is located on Via Banchi di Sotto, opposite the former Jesuit convent that today houses the University of Siena. It was built by Giacomo and Andrea Piccolomini Todeschini, nephews of Pope Pius II (Piccolomini) and was once the town house of members of this dynasty who grew to considerable power and influence from the 12 C when they began to act as bankers to the Papal Court in Rome. The original project was probably a joint effort with Bernardo Rossellino, the favourite architect of Pope Pius II, Enea Silvio Piccolomini. The work, which started in 1469, was supervised by Pier Paolo del Porrina. The elegant and well-proportioned three storey stone facade of the palazzo is decorated with two coats of arms of the Piccolomini family as well as by mullioned and guelph cross windows, surmounted by a cornice. The capitols of the columns that line the interior courtyard are by Marrina, who completed them between 1509 and 1510. The opulent design of the building is reminiscent of both Palazzo Ruccelai, designed by Leon Battista Alberti, and the Palazzo Piccolomini in Pienza, also designed by Rossellino. When the Piccolomini line went extinct, towards the end of the 17 C, the Consorteria Piccolomini decided to rent the palazzo to the Collegio Tolomei (founded by Celso Tolomei in 1629 as an institution for educating young nobles), which continued to occupy the building until the beginning of the 19 C. When the Collegio moved to other premises in 1824, the palazzo was granted to the Scrittoio delle Regie Fabbriche and was occupied by government offices. Since 1858 the building has housed the Archivio di Stato state archives, which contain a fine collection of artistic and literary documents, including the so-called ‘Galleria delle 103 Tavolette Dipinte’ the covers of the Biccherna e Gabella accounts books of the city of Siena from the 13 C to the 18 C.
Not far from Piazza del Campo, along the prestigious Via di Città, stands the Palazzo Piccolomini known also as Palazzo delle Papesse. This palazzo was built by order of Caterina Piccolomini, sister of Pope Pius II, between 1460 and 1495, according to a design by Bernardo Rossellino. In typical Florentine Renaissance style, the palazzo is on three floors, with the ground floor sheathed in studded stone and mullioned windows opening on the floors above. 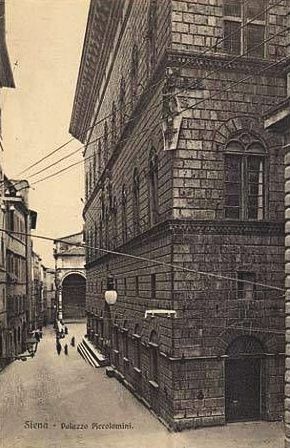 In 1884, the palazzo was acquired by the Bank of Italy and has since undergone a number of refurbishments, including the decoration of some first floor rooms with neo-Renaissance frescoes. A terrace on the second floor offers a fine view of the so-called facciatone, the facade of the Duomo, while the whole of the city can be observed from the covered roof terrace on the summit of the palazzo.